This was by far the largest stencil I have cut. It took me about 2 days to cut. It was really hard to get pictures of the finished product due to lighting. Hope you guys like it as much as I do. So in cleaning my garage recently I found probably around 50-70lbs of 100% wool strips ready to be made into braided rugs. My grandmother used to make these and this was her stash. The problem is they've been sitting there for so long they smell musty and have a ton of dust, drywall dust and even some mud (wtf?) on them. I'd like to wash them before I get started braiding but these seems like a huge task and I'm really sure the best way to go about it. The best I could come up with is soaking them (in a mesh bag) in cold water int he washer, doing 2 spin cycles and then popping them in the dryer with no heat. I know they might felt a little but that's okay. I don't have a clothes line to air dry and the image of having streamers of wool strewn about the house drying seems amusing but a terrible idea. Does this method sound reasonable? Any other suggestions? This was my first attempt at making my own dreads. There are 100 total. They are single loop. Sadly I am having difficulty putting this many in my hair. My friends was supposed to help me but then she injured her shoulder at work. If you live in the san diego area and want to lend me a hand that'd be awsome, lol. The colors are bubblegum, candy caned bubblgum/plum, and plum. EDIT: I finally got them put in last thursday. Sorry for the myspace-esque photos. my boyfriend works nights and hasn't been able to take pics for me. So my sister and I closed on our house a few monthes ago. Since then I've been working on turning it from "old lady" to something a little more our style. We decided to do the laundry room Day of the Dead themed. It's been painted hot pink and slowly I've been adding stuff to fit the theme. I just finished the curtains. I'm not 100% happy with them but they aren't bad for now. A close up of the embroidary. It's much bolder in RL. The rickrack on the skull is actually neon green. Here's my entry. This is the first time I have completed a craftster challenge, yay! 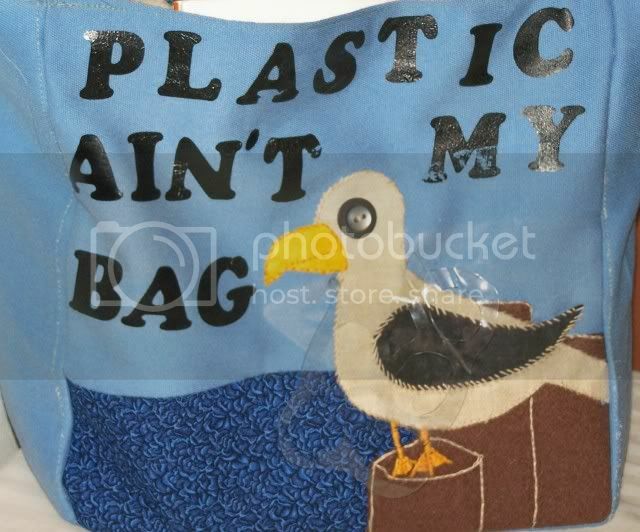 the bag is 12"X12"X8" it says "plastic ain't my bag" the seagull has a six pack ring around his neck but it's kinda hard to see. My wedding is next year and we're doing a wintery theme. snowflakes, icecicles and the like. I saw these japanese gift ball tingies and thought hey! If I did those in white they'd look like snowballs! I think they sound awsome as wedding favors. Problem is I have no clue what to put in them. Any ideas? here's a link to the ball things.. 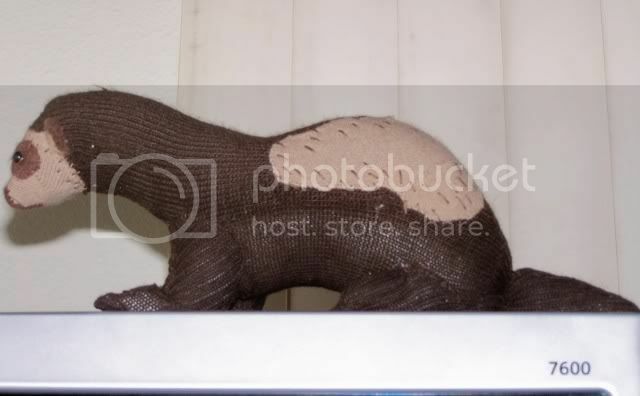 I had a request to try out making a sock ferret. I've owned ferrets beofre so I wonder why I hadn't thought of this myself. Anywho here is my sock ferret. I named her Widget after my darling little carpet shark. I'm not entirely sure if she's done. I had wanted to add some light colored gaurd hairs but was unable to find the right color floss. I also may decide to add some light colored felt right behind her eyes to make them stand out a little more. I think the eyes I found are perfect though. I just happened across them at Wal-Mart. thanks for looking. questions/comments are more than welcome as please let me know if there is an animal you'd like to see. 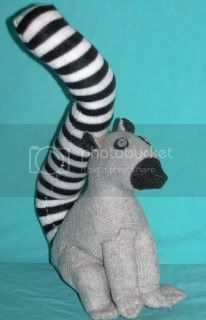 Here are a few more sock animals I have done. 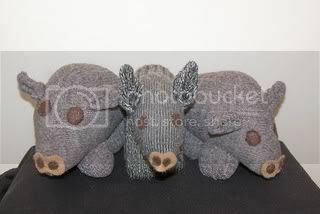 The penguin(s) and javelina(s) have been very popular. 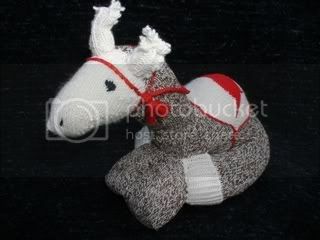 I'm really surprised that no one wanted the sock camel. 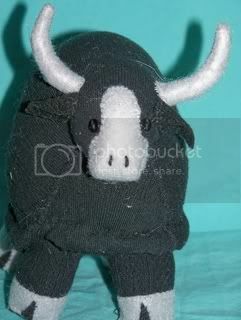 He was the first sock animal I did other than the classic monkeys. The camel started all of this. I fell in love with him.The best part is he's made with only one red heel sock. Anywho, hope you like. comments are always appreciated. Here are a few more sock animals I have done. I try to make them as realalistic as possible. 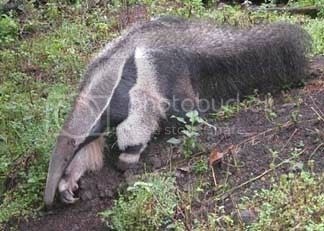 The anteater isn't quite finished he needs some embroidary and eyes. I posted pics of the real animals as well for comparison. 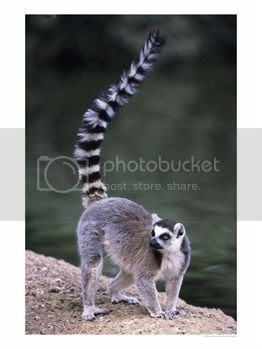 I think I may rework the lemur some. 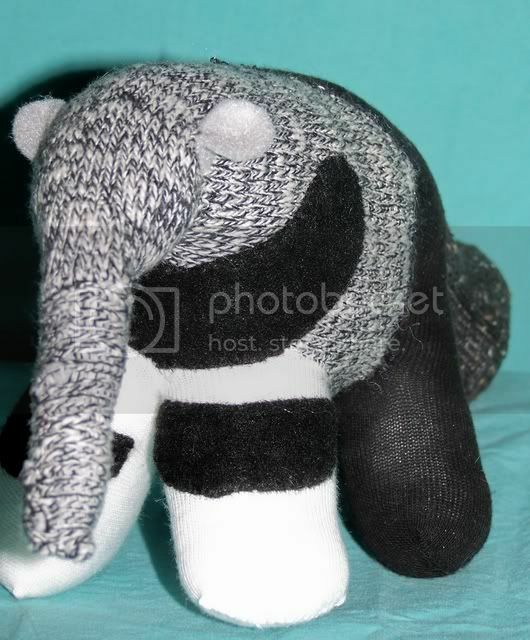 I make sock monkeys and sock animals. Knowing my love of socky creatures I recieved some sock monkeys PJ's for christmas. My daughter got a matching pair. I love them. I thought to myself, "wow, some sock monkey slippers would be awsome with these!" I found some online for $30.00 I thought that was kinda high for slippers and as usual i told myself I could just make them. The more I thought about those slippers the more I thought about the poor little sock monkeys who gave their lives for them. 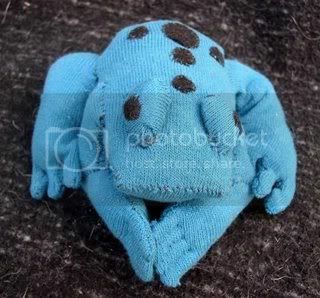 I thought there is no way I could cut apart one of my sock babies and make clothing from them. 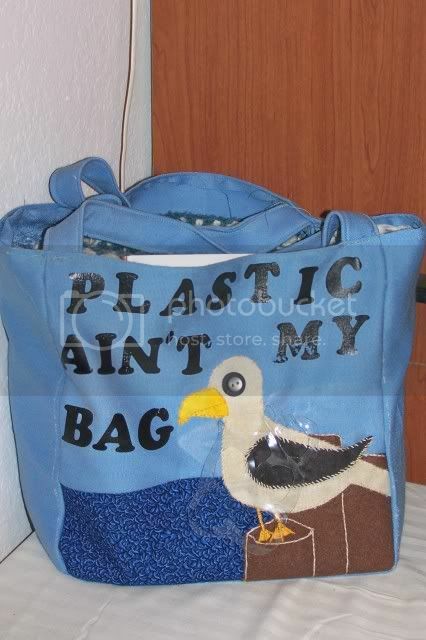 I also had this problem when I came up with the idea of a sock monkey purse. With the tail as a handle and the opening along the back. I know it must not be normal to think this way. 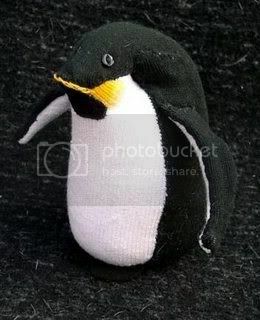 I spend hours bringing my socks animals to life. I know their flaws and quirks. They have personality all their own. I write them back stories and give them names. They live in my home until I send them off to their new homes, sometimes I keep in touch with their new familes.